Get ready to sing the Jailhouse Rock and get All Shook Up while listening to your favorite Elvis hit songs spinning the reels of the latest WMS BLADE™ Stepper Cabinet hit, Elvis Shake Rattling Reels Slot. The theme and the features of the slot machine make for a perfect filmic game that takes you on a realistic journey through the different eras of the King’s career as the reels are spun. With a player-friendly interface and tons of added features implemented into the game, Elvis Shake Rattling Reels Slot guarantees endless hours of nonstop fun as well as promising wins. Elvis Shake Rattling Reels is played on 3 reels, featuring 5 paylines across those reels. Each credit is worth $1.00 with max bet just $5.00 a spin. Max betting all 5 paylines is the way to trigger, and have access to the progressive jackpots. Payouts are adjusted accordingly to your current wager per spin. Elvis Shake Rattling Reels can be found at land-based casinos across North America. Just look for the Scientific Games ‘banks’ or section of the casino and you are guaranteed to find Elvis Shake Rattling Reels Slot. The game combines three different interfaces, with each one uniquely selected and focusing on mechanicals that players love; progressive jackpots and huge payouts! Elvis Shake Rattling Reels Slot has been paying out major wins since its launch, along with the Elvis Lives slot. It rewards the progressive jackpots more than any other progressive slot sitting on casino floors. Players across the USA has been enjoying progressive wins from the three-tiered progressives since its launch last year. The three near-area progressive jackpots include Vegas Elvis (Grand), Hollywood Elvis (Major) and Memphis Elvis (Minor). Choose your gaming mode! Choose between the three playing modes, with each one featuring its own set of symbols and payouts, including the jackpots. Trigger three scattered BONUS Wheel symbols to activate the wheel bonus for a chance to sing your way to the top of the wheel where the standalone progressives await. The bonus wheel symbols are included on other symbols, meaning the bonus symbols may or may not appear across the reels. Once the feature is underway you will play the bonus accordingly, to your playing mode. If the wheel lands on the same colored wedge that matches your player-selected Elvis, a free spin is awarded which, in return, ups your chances to land on one of the progressive jackpot wedges. If you land on one of the jackpot wedges, you win that jackpot. There’s no limit on how many free spins of the bonus wheel you can trigger. The more free spins you win, the better your chance at landing a nice size bonus prize and landing on one of the jackpot wedges. Elvis Shake Rattling Reels Slot offers two different wilds. The first one is the traditional Wild icon, and the second is a 2x Wild. Of course, the 2x Wild pays out two times the original win, while the regular wild pays out just one time. Other symbols included in the game are Cherries, Purple Sevens, Blue Sevens, Red Sevens, Single Bars, Double Bars and Triple Bars. Spin three wilds and Elvis will award the top fixed jackpot of the game. 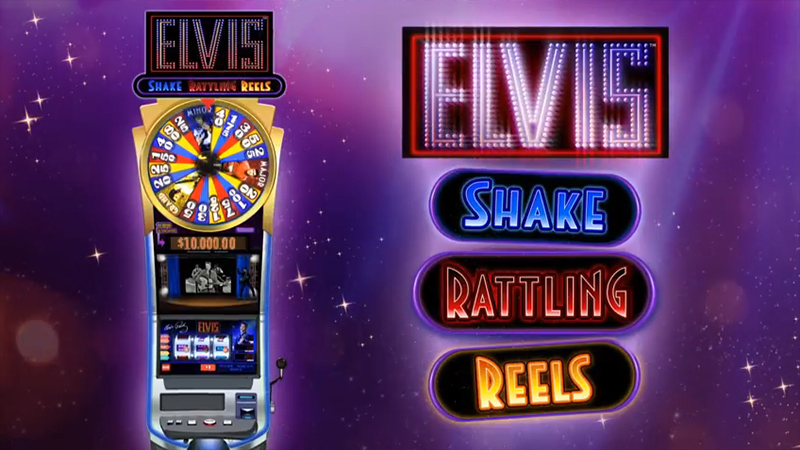 Elvis Shake Rattling Reels is featured on the clear LED panel allowing for high-definition graphics, complete visibility of the reels with every spin, and even giving the traditional slot machine vibe with having access to pulling down the slot lever or handle instead of hitting the spin button. One of the eye-catching features is the reels. Every time you spin the reels they shake, rattle and then roll! The sound effects and background music are spot-on! Singing along to one of Elvis’ hit songs is a great impersonation as if you were attending one of his concerts. The King is definitely back, and is a bigger icon now than ever thanks to WMS Gaming and Scientific Games Interactive. The transformation of turning one of the most cultural icons of the 20th century into a slot lovers dream is one of the best strategic moves any gaming provider could do. Go for the gold record just as Elvis did whether you’re in Memphis, Vegas or Hollywood! As Elvis said; it’s always one for the money, two for the show, three to get ready, now spin, spin, spin the Elvis Shake Rattling Reels Slot!